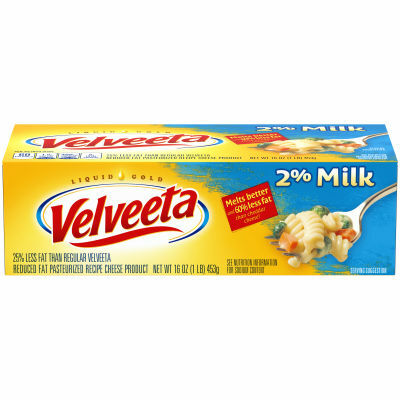 Velveeta 2% will become your go-to to make any meal rich creamy and melty, but with 60% less fat than cheddar cheese! The creamy consistency transforms into gooey liquid gold when melted, making it perfect for nachos or your favorite casserole. Liquid Gold can make any meal a hit! 2% cheese loaf melts with perfect consistency, which means you get to enjoy even cheesier meals. Transform your favorite vegetable, master mac & cheese or start a party with our famous queso dip. Velveeta can make any meal Liquid Gold Delicious! Serving size 1 oz (28g/ 3/8 inch slice).